A large contributor to any successful bike ride isn’t just the location, but the bike you do it on. 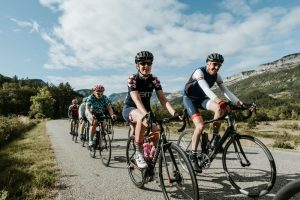 At Bike Odyssey, our industry-leading cycle touring experience is designed around the very best equipment, all of which is used to ensure that you get the absolute most out of your tour. Whether it is the bike itself, the GPS equipment or the supplies the support staff used, you can rest assured knowing that you will have access to the very best technology with your Bike Odyssey cycle tour. First and foremost, we use only the highest quality bikes and respected brands. Using models from Trek, Specialized, De Rosa and Canyon, mechanical and DI2 in Europe and South America, we know that we will be able to fit you to a bike that matches your riding experience, height and weight. If you have a preferred brand of bike, we will see if we can track it down for you, after all, we want you to be as comfortable and have the best experience possible. With fantastic relationships with these brands and their suppliers, you will have the chance to ride a top-of-the-line bike while you are cycle touring with us. We have tried and tested a range of tracking technology. Right now, the cycle touring market is saturated with the use of Garmin GPS units. However, at Bike Odyssey, we like to be ahead of the curve so we have invested in Hammerhead Karoo. 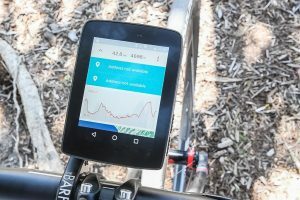 The Karoo is a game-changing cycling GPS unit and there are many reasons why it is perfect for cycle touring. Firstly it uses smartphone technology so it is a pleasure to use – a great reactive beautiful touchscreen, a fast processor, clear clean navigation, great syncing and sensor compatibility and lastly, soon we will be able to track your location, so you don’t get lost. While other cycle touring companies are really only just starting to adopt GPS units we are moving on to genuine top end technology. Not only will you be using the best equipment as you ride, but the support vehicles will also be of the highest quality. Stocking a range of healthy snacks and drinks including electrolytes, fruit, nuts as well, of course, local delicacies (which are all inclusive) every time we stop for a break you can fuel up for the next part of the ride. If you have an injury or are struggling with a section of the expedition, you can jump in the van and rest for a while. 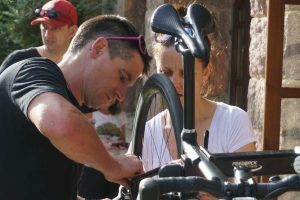 We are also well equipped for any bike maintenance and on every tour there is at least one skilled mechanic, so should the worst happen, you will be back on the road in no time. Cycle touring has never been easier with Bike Odyssey’s industry-leading technology. Our professional guides know everything about the best cycle touring gear and tracking devices after years of riding. If you want access to the leading brands in riding, contact Bike Odyssey today to book a tour.